A Review of the Coronet Half Eagles of 1839-1908. Mint Engraver Christian Gobrecht developed the Coronet type gold coin for the purpose of replacing the Classic Head design. The $10 Eagle began carrying the new design in 1838. 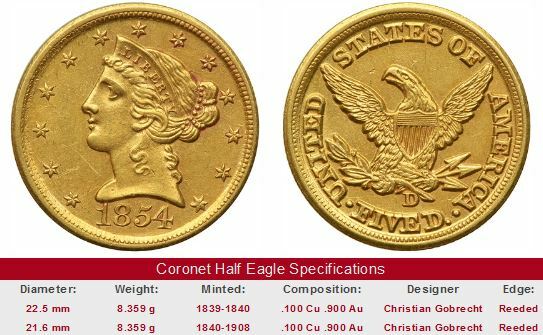 In keeping with Mint tradition of uniformity, the $5 Half Eagle and the $2.50 Quarter Eagle transitioned to the Coronet type in 1839 and 1840 respectively. No one could have predicted the steadfastness of Gobrecht’s work. Coronet coinage continued uninterrupted until 1908, a run of 70 years. Many numismatists also refer to the Coronet motif as the Liberty Head type. In drawing Miss Liberty, Gobrecht was guided by the ancient Greco-Roman influence. Liberty faces left, her hair tied in a bun, held in place by a string of beads. She wears a coronet (a type of small crown), inscribed with the word LIBERTY. The perimeter of the obverse is adorned by 13 stars. The reverse is characterized by the John Reich eagle from 1807; its wings slightly modified to span the full breadth of the coin. As the nation was ripped asunder by the American Civil War beginning in 1861, a religious fervor swept over the land as ordinary people in ever increasing numbers sent prayers to the Almighty for safe guidance through those extraordinarily difficult times. That sentiment led to the placement of the motto IN GOD WE TRUST on the two cent piece of 1864. On March 3, 1865, Congress mandated the motto be placed “on all coins able to accommodate it”. 1866 was the first year IN GOD WE TRUST appeared on the gold half eagle, written across a scroll above the eagle on the reverse. Gobrecht’s successor, James B. Longacre, oversaw the addition of the motto. As the North’s military prospects faded, all coins, especially gold and silver were hoarded as the best form of economic security in perilous times. The disappearance of the precious metal coinage convinced the federal government to suspend specie (i.e. coin money) payments out of the Treasury on December 30, 1861, in an effort preserve funds to finance the war. Greenbacks were issued beginning in early 1862 by the US government. Greenbacks were not redeemable in gold or silver, so their value to the public was based on the perceived solvency of the federal government. Thus, when battlefield results soured, the value of Greenbacks plunged to as low as 40% of their face value. When the Union Army fared better, Greenbacks were valued as high as 70%. By war's end, almost $450 million in Greenbacks were in circulation. A great political battle ensued over how and when to retire the Greenbacks. Early in 1862, the U.S. issued paper money called “Greenbacks”. By the end of the war, nearly $450 million in Greenbacks were in circulation. Politicians took sides on how and when they were to be redeemed with precious metal coinage. One coalition, led by creditors, wanted the Greenback removed because of its inflationary effect on the economy; they didn’t want repaid with money that was worth considerably less than when they loaned it out. Opposing them were indebted farmers and laborers, who preferred inflationary money policies. On January 14, 1875, Congress passed the Resumption Act. Under the provisions of this act, the Treasury Secretary was ordered to redeem in coin Greenbacks presented for exchange on or after January 1, 1879. In anticipation of greater demand for gold coinage, the Mint dramatically ramped up production of half eagles. From 1878 to 1882, an average of nearly 3 million half eagles were produced annually, compared to less than 250,000 a year from 1839-1877. It comes as no surprise that over a 69 year production period, there are many rare, key dates within the Coronet Half Eagle series. The coins from the Dahlonega and Charlotte branch mints exist in very limited quantities, and are desirable acquisitions for any numismatist. The most significant of these is the 1861-D, whose historical connotations rank high because some of them were struck by the Confederacy at the onset of the Civil War. In fact, just about all half eagle dates struck during that epic conflict are quite scarce; because of the aforementioned widespread hoarding, Mint officials chose to greatly limit production. The 1864-S has especially captured the attention of collectors. Half eagles from the rough-and-tumble Carson City Mint dated 1870-CC, 1873-CC, and 1878-CC have also found high favor. Of course there are ultra rare members of the Coronet club too. The 1854-S, issued during the first year of existence for the San Francisco Mint, had a mintage of only 268, most of which were destroyed. None have been sold in recent years, at least not publicly. The 1887 has a mintage of only 87, all proofs. Problem-free examples of the 1887 bring more than $100,000. An aura of mystery hangs over the 1841-O. Mint records indicate that 50 were struck, but none are known in any collection today. Scholars believe they were all melted, but should you happen to discover one in a recently inherited box of coins, the numismatic world would be stood on its head, reporters rushing to be the first to announce the finding of a long lost coin worth more than a million dollars. Our advice is not to buy key date Coronet Half Eagles that have not been certified by one of the four leading grading service companies: PCGS, NGC, ICG, or ANACS. Most collectors have greater trust in coins graded by any of the Big Four, and will pay more, knowing when they decide to sell, prospective buyers will be similarly confident. On the flip side of the coin, pardon the pun, most knowledgeable collectors shy away from lesser known grading services, or want substantial discounts, because so many of the other services have a reputation for less stringent grading standards. The links below initiate a search of eBay coin auctions to find key date Coronet Half Eagles. The left hand side of each "Sales Box" depicts value trends over a very long period of time for the specified key date in F-12 condition. The percent annual increase since 1950 is computed for comparative purposes. In the case of Charlotte and Dahlonega coins, value trends of the 1840-C and 1840-D are typical of the group and so are presented here, but the links are coded to bring up "C" and "D" half eagles, with the exception of the 1861-D, which has a sales box all to itself. Key date Coronet Half Eagles are a challenge to find, even in a venue as large as eBay gold coin auctions. Much of the time, you'll strike out in your search. Keep checking back, and remember, be patient and follow the advice on grading.The coin pictured for sale in the right hand side, if any, is not necessarily the same condition coin as that represented in the value trend analysis on left hand side.